The following group types are not accepted by this hostel: Junior / Primary School, College / University, Sports Group If you have misrepresented the type of group you are booking for, your booking may be cancelled by the hostel." We are located in the heart of Koh Phangan, Thongsala, known for its legendary bars, nightly parties and is a constant a hive of activity. Close to delicious street food at the famous night market and walking street, we can ensure you will not go hungry or bored!! We are also a 20 minute taxi ride away from the famous FULL MOON party beach!! Our location places us perfectly in between the beautiful beaches in the North and the craziness of Had Rin! Relax Corner offers both dorm and private rooms, all of which are air-conditioned during the night to ensure you have a comfortable nights sleep. Tea and Coffee is included and we also have placed hydration stations around the hostel, especially important after a big night out!! Our bar serves up DAILY happy hours! We have awesome events including quiz nights, beer pong, themed dress-up nights and much much more… Good times are our business! We have an awesome travel crew who are ready to help with all your travel needs and of course we can’t forget to mention that we are the home of the 3rd best beach in all of Thailand!!! Not only do we offer you a hostel with family vibes we also offer a host of recreational offerings to ensure you have plenty to do during your stay! We look forward to showing you an unforgettable stay in Koh Phangan! Very nice and cheap place.! Clean (aircon) rooms and bathrooms. Comfortable beds. Private locker. Really friendly staff. Nice bar and on Fullmoon night free buffet or BBQ. They arrange taxi, ferry, bus and plain tickets. The location is close to Thong Sala, many shops, bars and restaurants on walking distance. For me the place to be.! Met de fullmoon party was dit het goedkoopste hostel wat we konden vinden. Alle prijzen schieten dan opeens omhoog. Voor de fullmoon party kregen we gratis diner van het hostel. Super leker eten en het was erg gezellig. Ook gaven ze ons glow in the dark verf voor op je huid voor de party. Super leuk!! Verder is prima hostel. Joe is a great Guy who makes a big effort to make your stay comfortable. Rooms are basic and clean. Showers are big. Hot water. And little breakfast if you would like any. The staff is very friendly and the bathrooms are cleaned every day. You can book Your bus or boat at the reception and the beds are comfortable. 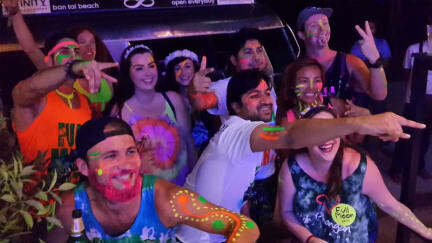 With the full moon party we got free food and free paint and they had drinking games. This hostel is obviously made for people coming only for the half and full moon parties. If you’re in Koh Phangan not for those parties like I was you will just find a dead hostel without English speaking staff. There is a bar but the drinks they sell are only to buy, guess, when the parties are going. I really think it’s such a shame that the non party people don’t deserve any help or hospitality or whatever. And the beds are horribly hard. 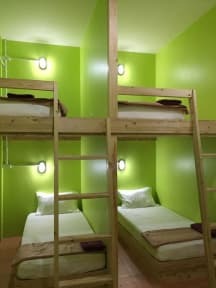 The first dorm with real privacy, the beds and showers were really good. I just didn't like the atmosphere at all, and I was there during the full moon party. I guess that says enough.